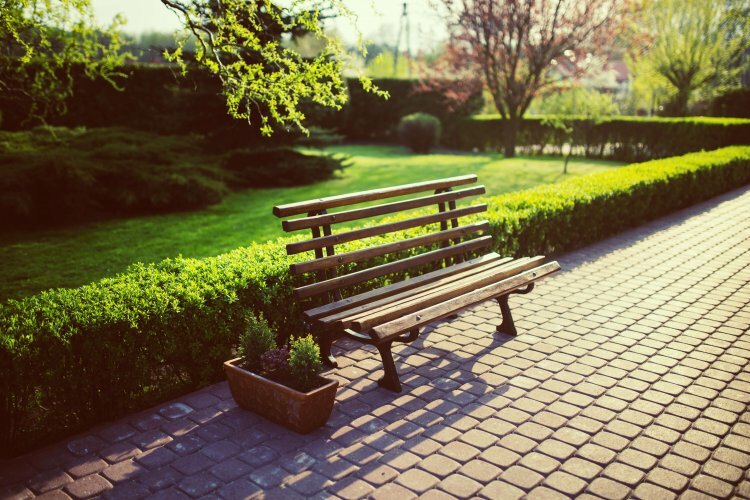 Cheap landscaping ideas are not actually hard to come by! Contrary to popular belief, they are everywhere. Also, you don’t actually need expensive solutions like putting up a gold-rimmed water fountain or anything like that. But there’s also nothing wrong with that if you want to do it! From choosing your preferred decorative paving slabs to adding ornaments and plant types, we’ll try to cover them all. Today’s theme is all about making the best out of a technique, our creativity, or solution rather than to use money to solve everything. Let’s try to go as cashless as possible! If you have limited real-estate, like most of us, and you’d still like to have a fence, this will always be doable! Adding a stone fence is excellent for small front yard landscaping. It adds security, and it does not take up a massive bulk of space, or at least it shouldn’t, depending on the type of stone you choose and how much of it you use. 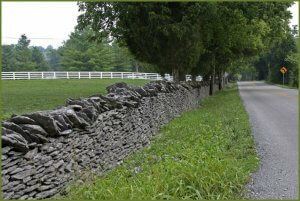 Plus, a stone fence gives off a powerful aura as if to say that you shouldn’t be messing around near it. Aside from that, when constructed well it is also a beautiful structure. Since protecting the family is of utmost importance, and because it also serves as a decorative piece while not being too expensive, we hit two birds with one stone with this first tip! Also, when choosing a type of stone, try looking at either concrete, fieldstone, or granite. What’s important is that whatever form you choose, you stick with it all throughout unless you have a unique design planned out. You may also want to check with your local supplier. Find out what’s locally available in your part of the country. These tend to be cheaper than exported materials. Nothing says cheap landscaping ideas like refurbished goods! Do you have anything in your home that meets the following categories? Like, say, maybe an old bathtub? If so, wouldn’t it be great to put plants in them? They’re fantastic! They protect the plants from invading rodents and some insects, and they are just cute. You can even start your very own mini-vegetable garden patch. 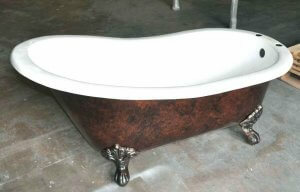 A great idea would be to spruce up the old tub and find annuals or perennials to fill the tub. Thus, plants for perennial hanging baskets would be great here. Though not exactly “hanging” per se, since their leaves would still hang off the tub, it works just the same in principle. You could even make this the centrepiece for a particular part of your yard. Encircle the tub with one type of flower and boom, you have a magnificent design. This, and so much more, would depend on your creativity. You could even box it in the center of 4 flower beds if you have ample space. 3. What if you have a tree stump? As far as cheap landscaping ideas go, this may take the cake as you wouldn’t have to buy a stump. What if there’s a tree stump left from the big storm or from when you felled the big one? Will it forever be just an existing eyesore? Well, no. We’re here to tell you that it doesn’t have to be an eyesore and it can even be a beautiful addition. Firstly, grab the splitting axe of destruction. Use that to carve out as much of the stump as you can. Second, drill holes straight down the center using the battery-powered drill to weaken the wood. The third step, we now have to use the chisel and hammer to be more precise in chipping away at the weakened wood. Finally, by this step, you must have a hole enough to put plants in. All that is left to do is to decide on which plants or flowers you’d like to have sprouting there. Also, fill your new planter with soil. This is a delightful DIY project as the results are incredibly low-cost whilst also being astonishingly attractive. It’s as if you breathed new life into an already dead tree. 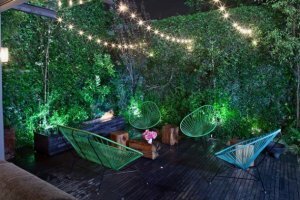 String lights are beautiful and they work wonderfully as cheap landscaping ideas; thus, they fit our theme perfectly. This one is an enjoyable DIY project, and it’s fairly straightforward. Get a durable string or wire. Recycled or new, as long as it can carry the weight of multiple bulbs. Acquire the bulb of choice. Unless you’re going for a unique design, we recommend having the same exact bulb for all of them. Size, shape, and color. You may even employ some home automation ideas and install Philip Hue bulbs so you can turn your garden into a light show by just asking your smart assistants; if that’s your thing! This adds a whimsical glow to your garden that can fit almost all occasions. If you’re throwing a rave party, switch up to different colored bulbs. For a romantic dinner, have a table ready with roses around it and use bulbs with a warm yellow glow. For when you’re having a cookout with friends and neighbours, just use the regular bulbs and brighten up the space so you’re garden and the occasion won’t feel dull and sleepy. For once, it’s not all about the money! Money solves a lot of problems, maybe that much we can all agree on. But also, it doesn’t have to. 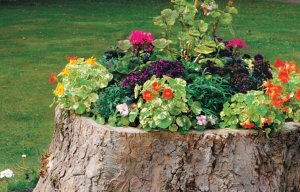 Where you can hire experts to plant flowers on your tree stump, we’ve outlined how you can do it yourself. Yes, you can just go and buy decorations for great landscaping ideas, and indeed that will make your garden beautiful. But we advocate practicing your creative side. After all, what starts as a hobby can turn into a lifelong passion. Who knows, you might be the next landscaper of the year that everyone goes to. When that day comes, we ask only one thing. Please invite us to the party! Until then, happy landscaping! Next article Do Your Potted Plants Have Soil Mites And Should You Get Rid Of Them?